Eager to attend your first Indian wedding in Singapore but not sure what to expect? From traditional customs to food and outfits, prep yourself with this guide and you’ll fit right in! Did you just receive your first invitation to an Indian wedding? Are you fretting over what to wear, what to bring and if there’s anything in particular you should be aware of? Our essential guide will help you understand what Indian weddings are all about and how you can have an absolutely amazing, colourful time while at one! As someone who has just had her wedding in October 2018, this guide would also include some personal experience and observations―it’s all still fresh in my head! 1. How long is an Indian wedding? Typically, traditional Indian weddings that closely follow the various ceremonies involved could go up to three to four days. Increasingly, however, couples are shortening the affair and keeping it within two or three days. For instance, my husband and I went for a three-day occasion, which included a traditional mehendi ceremony, the religious wedding ceremony at a temple and a dinner reception at a hotel. We could have squeezed everything into two days but we wanted time to breathe in between the ceremonies, so we opted to separate the temple wedding and dinner reception into two days, while the mehendi ceremony happened on an earlier day. 2. What happens during the wedding ceremony? For a Hindu wedding: The bride and groom will be seated under a mandap, a canopy-like structure where the priest will conduct a ritual and after which the couple will walk seven rounds around the agni, an enclosed fire. 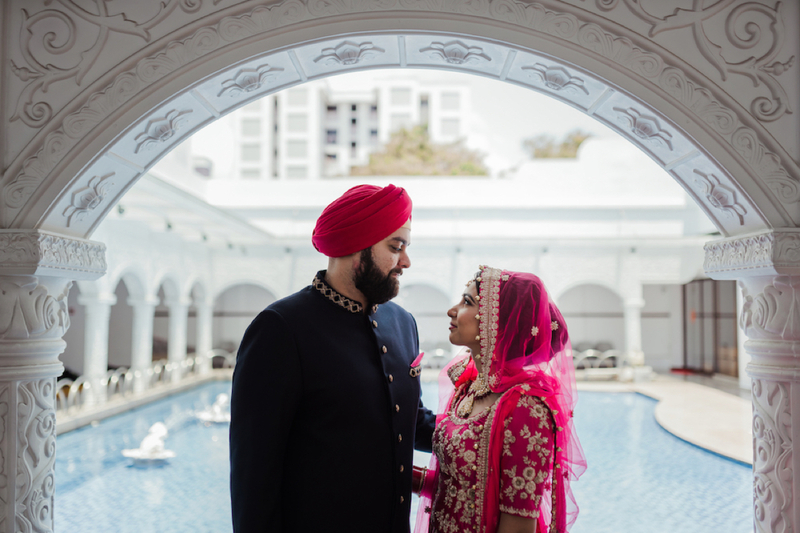 For a Sikh wedding: The ceremony will take place in a Sikh temple where the bride and groom will be seated in front of the prayer hall before the Sri Guru Granth Sahib (the Sikh holy book). When everyone is seated, the priest will begin by reciting the official wedding ceremony hymns as laid out in the holy scripture, while the bride and groom walk four rounds around the area where the Sri Guru Granth Sahib is placed. Usually the entire ceremony will be completed before noon. Once the ceremony is over, while it’s a happy occasion, note that clapping is not permitted in the prayer hall. Additionally, these ceremonies do tend to be about three hours or longer. For my Sikh wedding, despite careful planning and taking delays into consideration, we still ran over by about an hour. All of which meant our guests had to stay longer. So as a guest, be sure to keep your day relatively free if you want to experience the full ceremony. 3. What gift should I get? Unless otherwise specified by the couple, boxed gifts are not a custom at an Indian wedding. If you do prefer getting a gift, it’s better to send it across beforehand to the groom’s or bride’s home as there wouldn’t be any designated spot to place it while at the wedding. Alternatively, a red packet or monetary gift would suffice. While there isn’t really a “market rate” on what’s a good amount to give, you can gauge based on how much you would spend on a gift if you had bought one. Lastly, it’s considered auspicious to have the denomination end in 1, such as $21, $51, $101 etc. 4. What type of food will be served? Depending on whether you’re going for a North Indian or South Indian wedding, the food served would be quite different. However, you can be rest assured that food will not be as spicy as you imagine Indian food to be. Simply expect to feast on a huge variety of dishes ranging from vegetarian to non-vegetarian, arranged in a splendid buffet style. Also, when someone offers you food, never say no or turn it down. This is often considered rude. Instead, accept it graciously and have a taste of the glorious selection. 5. Will alcohol be served? Do not be surprised if you don’t find any alcohol at the wedding―especially at the religious wedding ceremony. You’re likely to find alcohol served only during the reception dinner event or the sangeet party. However, some families may opt to keep the entire wedding alcohol-free. As a general rule of thumb, the brighter the better. If you can, shop around for some traditional outfits and show them off at various ceremonies. For the ladies, go with a sharara, lehenga or a sari and you would fit right in. For the men, simply opt for a kurta pyjama. For women who prefer to go with a sari, bear in mind that it might be difficult to wrap it and handle it throughout the day, especially if it’s your first time wearing one! While shopping for outfits though, be sure to avoid the colour white―this colour is often reserved for funerals. However, if you know the families well and they’re not as traditional, then go ahead and don beautiful cream, beige or off-white outfits. Finally, when it comes to attending religious ceremonies, it is important to ensure that your legs and shoulders are covered and you have a scarf to wear over your head, especially for Sikh weddings. From experience, most non-Indian guests do not know this and would unknowingly turn up in short dresses, shorts or camisole tops, which would not be permitted in the temple halls. At the end of the day, know that Indian weddings are a wonderfully colourful affair, filled with pomp, lots of dancing and an irresistible array of food at every event. So put on your most colourful outfits, your dancing shoes and come with an empty stomach and get ready to spend your week enjoying the celebrations! Credits: All images of Tarandip and Manveer’s wedding by Moomedia.